Timber Floor Sanding - My floors look like new! We hope you enjoy viewing our spectacular before and after pictures and inspire you to have your timber floor renovated by a professional specialist at Harbour Floorsanding. Matai timber floor finished with Gloss polyurethane. A living room with plaster left on a Rimu floor finished with a Satin polyurethane. A living room with Rimu floor exposed from beneath carpet finished with Gloss polyurethane. A living room with old schlack covering a Rimu floor finished with Satin polyurethane. A hallway with a Rimu floor finished with Low-Sheen polyurethane. A hallway with old lino backing left on a Rimu floor finished with Low-Sheen polyurethane. A lounge with a gorgeous Rimu floor finished with a Gloss polyurethane. A lounge with an immaculate Rimu floor exposed from beneath old carpet finished with Low-Sheen polyurethane to lessen any scratches showing from the owners dog. 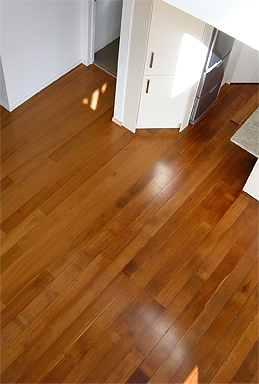 Before, During and After photos of a bedroom with a Rimu floor. We lifted the carpet, removed staples, punched and filled nail holes, sanded and applied Low-Sheen polyurethane. A hallway with an attractive Rimu floor finished with Low-Sheen polyurethane. Low-Sheen is a hard wearing, natural looking coating which assists in hiding any scratches or imperfections over time. Fantastic if you have children and/or pets. A Tawa timber floor located in front of a fire with burn marks from embers. 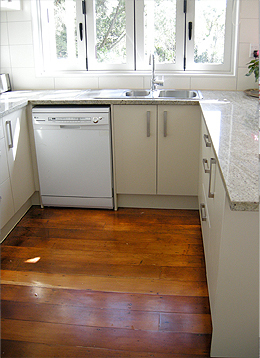 A Tawa timber floor finished with low-sheen polyurethane. A kitchen with old lino covering a Tawa floor. We lifted the lino, removed the glue, punched and filled nail holes, sanded and applied Satin polyurethane. An old villa with Kauri timber floors. Another refreshed Kwila timber floor. An aged Pine floor covered with paint splatter. We punched and filled nail holes, sanded and finished with Gloss polyurethane. A kitchen which had old square tiles glued on to a Pine floor. We lifted the tiles and removed the glue, punched and filled nail holes, sanded and finished with Gloss polyurethane. Before and After pictures of a kitchen with a stylish Tasmanian Oak floor. We punched and filled nail holes, sanded and applied water-borne satin polyurethane. After picture of an entrance floor and stairs with glamorous Tasmanian Oak. We punched and filled nail holes, sanded and applied gloss polyurethane. Before and After pictures with old lino backing. Before and After pictures of a timber floor with new repairs. Dilapidated cork floor refurbished and finished with Satin polyurethane. Workshop lunch room cork floor finished with Gloss polyurethane. Massey Primary School Hall particle board / chip board flooring with new line markings. Refurbished particle board / chip board dance floor finished with Gloss polyurethane. An after photo of a living room floor in a rental property with particle board / chip board finished with Gloss polyurethane. Polyurethaned timber floors are ideal for rental properties as spills can easily be wiped up before they stain, ensuring you will never have to worry about maintaining a stain filled carpet again. You can prolong the life of a polyurethaned floor by re-glazing between tenancies.